A report on Friday claims Apple will soon roll out a for-pay chat service to support those users who need help with products no longer covered by AppleCare protection plans. Citing sources familiar with the project, 9to5Mac reports Apple will implement a new online chat payment system that would charge customers for live support in much the same way as the company's phone service operates. Rumored to be coming as soon as next week, the system would would deviate from Apple's existing online chat service. Currently, users can be connected to a representative via Apple.com's Support webpage for no additional fee, even if the product in question is no longer covered by AppleCare. As reported, the new system would essentially roll online chats into the same category as phone-based support, with customers able to pay a one-time fee for help regarding an out-of-warranty product. Users will be able to select a $19.99 "pay per incident" fee or purchase extended AppleCare protections. The change is said to affect chat support services worldwide. In order to get the system up and running, Apple reportedly had to develop a new secure Web-based payments system that allows service representatives to charge customers within chats. With the payments method in place, customers will reportedly be able to expedite hardware repairs and replacements that usually require a credit card. 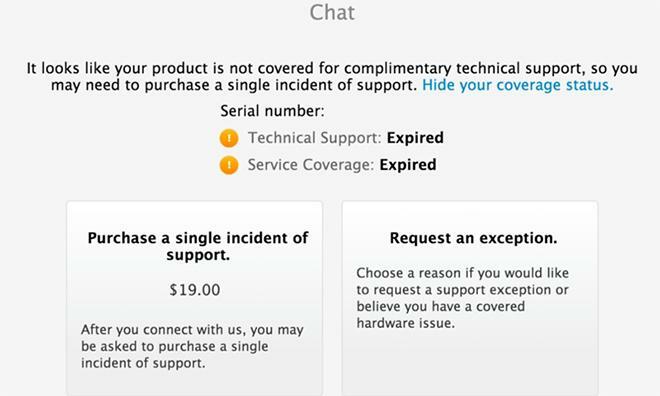 Apple first introduced live online chat support in August of 2013 as part of an AppleCare Support webpage redesign. Since then, the feature has been available for free.